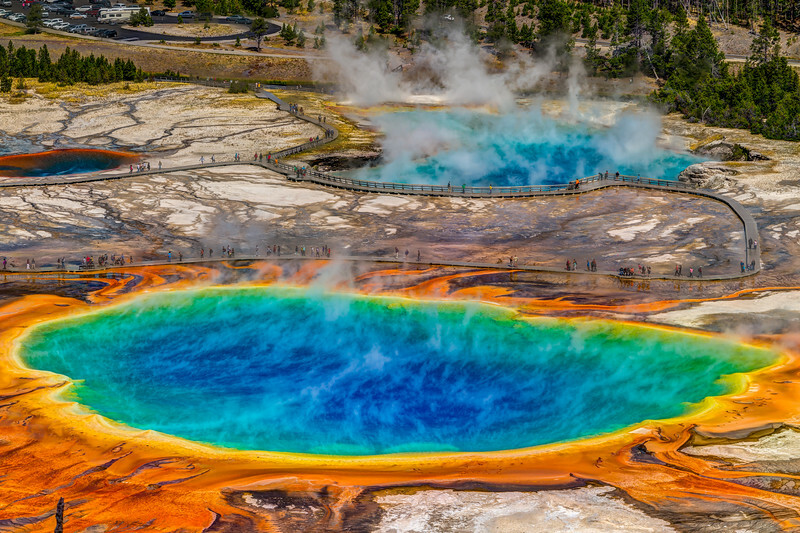 The Grand Prismatic Spring in the Midway Geyser Basin at Yellowstone National Park. 🔸 The spring is approximately 370 feet in diameter, 121 feet deep. With a temperature 160°F in the center (blue) and gradually cooling at the outer edge (red). It's also the largest hot spring in the United States, and the third largest in the world. 🔸 The vivid rings of rusty reds and vibrant yellows and greens that encircle it are caused by pigmented bacteria in the algae mat that live within specific extreme temperature ranges at hot springs. The bands of color correspond to the bacteria’s grades of tolerance. Where one kind of bacteria reaches its temperature tolerance, another type immediately takes over. 🔸 Steam often shrouds the spring which reflects the brilliant colors. 🔸 The Grand Prismatic Spring discharges an estimated 560 gallons of water each minute.